This exquisite masterpiece of formal integrity, hollowing, detailing and finish, is part of a small series of tapering cylindrical agate bottles. Each has a small, outer neckrim, a typical feature of the Palace Workshops, as well as a neatly recessed flat, circular footrim. 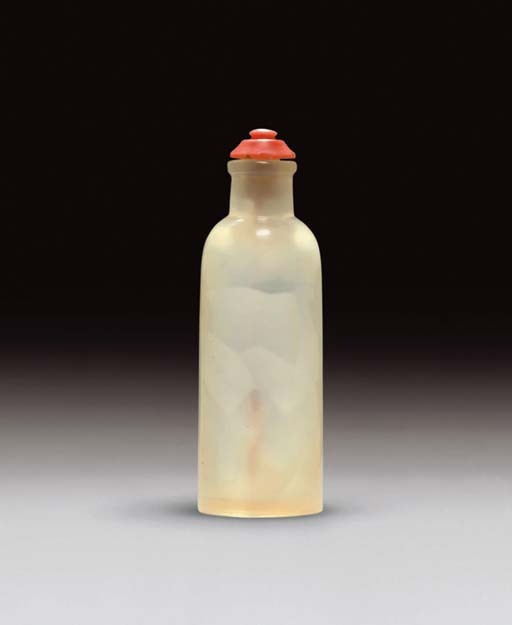 Other examples include one in the Bloch Collection (illustrated by Moss, Graham, Tsang, A Treasury of Chinese Snuff Bottles, Vol. 2, Quartz, no. 358, which bears the mark Yijin Zhai (The Studio where Imperial Favor is Appreciated) and was made for Prince Yongxing (1752-1823), and another formerly from the Alice McReynolds Collection (Sotheby's, New York, 16 April 1985, lot 103).